Tomorrow is the feature freeze dateline for the fifth release of the OSGeo Live project. As always we are at the last chance to update our scripts to add to the DVD our latest release of gvSIG. So thanks to the help of José Vicente Higón, from Software Colaborativo, I’ve updated the script. Thus, the next OSGeo Live DVD will ship with gvSIG 1.11. There are also some changes. As gvSIG 1.11 comes with an integrated help (yes it’s on the, surprise!, help menu) I’ve removed downloading any documentation. With the overview, the integrated help and the nice quick start created by Simon, the OSGeo Live disc has enough information for any newcomer. The interface will start in English by default so no problem for new users struggling about how to change from Spanish to whatever. I’ve spent a couple of hours to create and configure a sample project using Natural Earth data present on the disc, showcasing a little of the gvSIG symbology and legend capabilities. I’ve also added a sample map with the typical suspects (grid, legend, titles, etc). So when any new user opens gvSIG this project will automatically be opened with data ready to play. I’m not fully satisfied with the sample project, we can do a lot more with Natural Earth data to show more gvSIG capabilities but well, for this time I think is good enough. Of course, as the disc will come with a lot of OGC services and other kinds of data, the user will be able to experiment and learn about a great stack of FOSS4G and open data!! This entry was posted in english, events, gvSIG Desktop and tagged foss4g, osgeo, osgeolive. Bookmark the permalink. Nice effort Jorge! 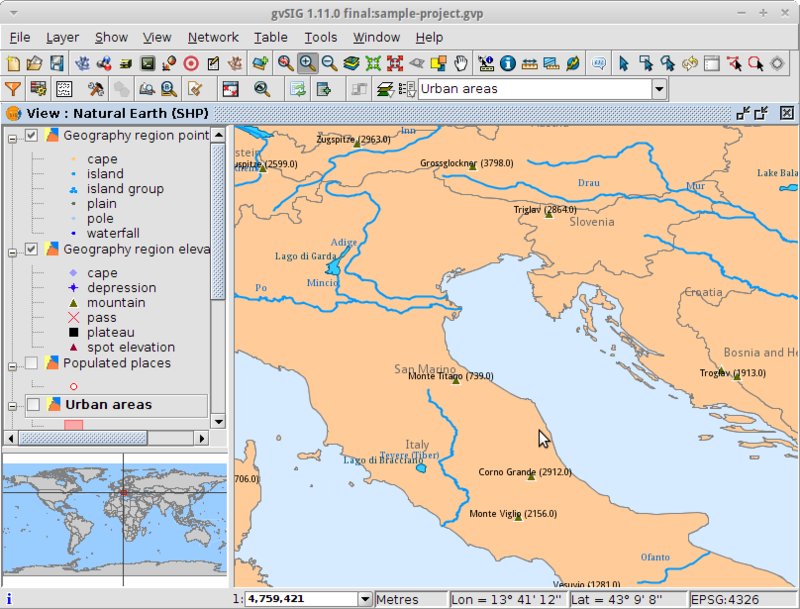 I have seen widely promoted osgeo-live at unigis master, where several students are using it. That’s a very good way to promote and spread the project. Besides, are you considering to set up a deb/rpm repository for the users having GNU/Linux? In terms of number of available users, having such a thing is like put your product on a enourmous comercial center. Just 1 click for the users to install the package. that’s a long term question, not easy to fulfill as you know. The OSGeo LiveDVD gvSIG is installed from a deb package created by Chevi to the Canaima Linux distribution. So yes, there is at least a GNU/Linux distro in the world with gvSIG packaged, and probably with some effort we could have a Ubuntu PPA for gvSIG distros but as always, (wo)man power is needed. Jorge, would be possible to have that package publicly available in gvsig wiki? Although I can’t afford personally to set up a deb/rpm repository, maybe some other person can. There is, for your interest, also a “dead” or “hibernated” working group at gvSIG portal dedicated to this effort so if you find anyone interested on working on that (s)he can join the WG for sure! !